Commins Menapi who took over from Stefan Metanolmski is yet to book a win and the pressure is on runners-up from last season to deliver to fans. Western United put to ground a commendable performance but newbies X-Beam had replies for their every effort. After an even start to the match Western United pushed forward through star international, Himson Teleda, who cleverly feigned a cross before dropping the ball behind Eddie Ramo who misread the situation. Ramo tried to recover but could not make it back in time. Following the goal Western United lost concentration while their opponents were enjoying more of the possession and using their runners to break down the right and left wing. A silly foul by Mostyn Sanga just before halftime ensured X-Beam were rewarded for their hard work with John Anita putting away a free kick to draw the score line flat. 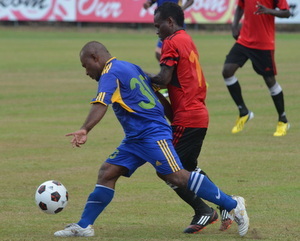 The second half started disastrously for Western United when a major defensive lapse saw Kidston Billy fire past Bernard Akuila to give X-Beam the lead. Billy continued to threaten the Western United goal and almost extended the lead which beat the goalkeeper but was just millimetres too high. A few minutes later X-Beam got close again with a shot that hit the underside of the cross bar before bouncing back into the field of play and while protests were made the match referee ruled play on. Late in the match X-Beam were caught offguard by a counterattack from Western United which saw them equalise to claim a share of the spoils. Teleda led the attack on the left wing and his cross found substitute Robertson Tanavoqa who tapped an easy one home. The result secures fourth place in the league table for X-Beam who now have booked three points from three games. Western United are one place below them in sixth place. See below play by play text.